Providing support and assistance to individuals and families for over fifteen years. In my practice, I help you meet and embrace your real self, in all its richness. Let’s discover what you truly want, and what is holding you back, going above and beyond mere stress relief to discover the hidden resources that have been yours all along. It is in a path uniquely suited to each of us that we are able to find our power, even as we seek ways to share it with others. My work has embraced the issues of domestic violence, childhood abuse, addiction, and severe mental illness, as well as GLBTQIA rights. I am a fully licensed social worker (LCSW #1964) and massage therapist (RMT #13394) actively engaged in counseling adults and children since 1999. I am also an accredited clinical supervisor. Currently, I work with adults, providing both individual and group therapy and welcome the opportunity to support you in a team atmosphere of complementary care practitioners. My personal life has followed an inclusive spiritual path since adolescence, and I embrace all paths that engender growth, responsibility, and joy. My father was a psychiatrist, and I therefore determined at a young age not to be a psychotherapist. Instead, what I discovered as I journeyed through a host of religions, philosophies and complementary practices was that there was at least a bit of truth in each serving to enliven and heal. However, circumstances in my life pulled me back in a more clinical direction in my mid-thirties, after being an arts administrator for several years. After peer counseling victims of domestic violence and creating a hotline for gay, lesbian, and transgender people in Durango, I led a successful fight in our tri-county area to defeat Amendment 2. 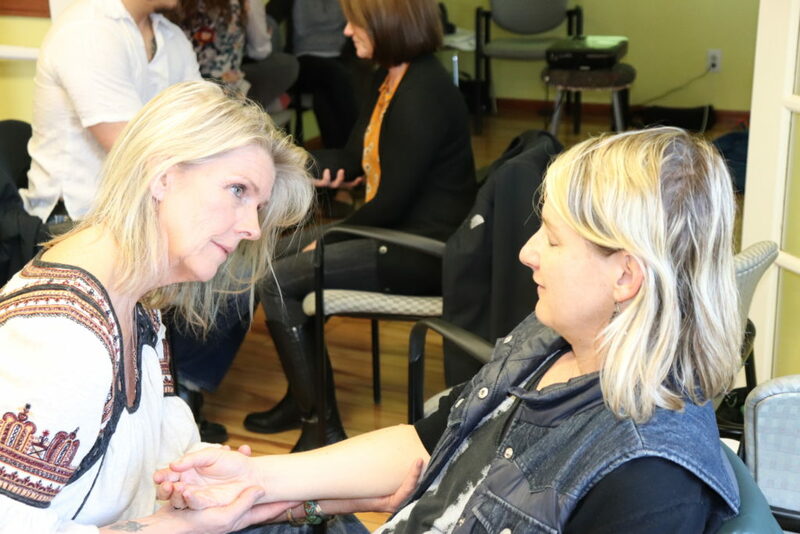 It was my honor to witness the positive changes people could make in their lives with the support and encouragement of others, and became excited about the question, how do people heal? Moving to Austin, Texas, I eventually entered a masters program in social work after I first became a massage therapist. Why did I do that? Initially for the most practical of reasons–not to go into debt while in school! I discovered, though, that I had the ability to intuit where my clients held stress in their bodies, and fell so in love with what the body could provide in both information and alleviation of distress, that I continued my practice with the intention of combining the two. First Reiki, then Craniosacral therapy, and finally Somatic Experiencing, all now contribute to the bodywork I provide, not only with emotional distress, but physical distress due to chronic illness, accident, violence, medical trauma and wartime injury. While I cannot yet say I know all the ways that people heal, I do know that this work has allowed hundreds of my clients to find relief without years of standard psychotherapy.